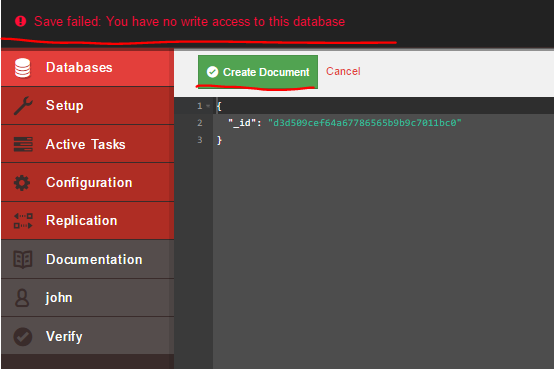 In the previous post we started discussing the security features of CouchDB. An interesting feature of CouchDB is that by default, in the absence of any registered user, everyone is anonymous and all users have full access to all the parts of the Couch DB server: databases, documents, configuration, replication, everything. This is probably so that newcomers to CouchDB don’t need to spend time on security settings before getting started on its features. So the first step is to create a server administrator who then can create new users to prevent anonymous access to the server. We then created two new users, Peter and Mary, and they were promoted to database administrators to a selected database. They can now administer the database that they were assigned to. They still face various restrictions. E.g. they still cannot perform server admin tasks and they cannot delete the database they are administering. In this post we’ll continue our discussion of this topic and concentrate on database level read and write access. We have Peter and Mary as the DB admins of the zipcodes database. Database members have read and write access to a database but they lack the database admin rights. If a database has no database members then all authenticated users can add and modify documents. Even though Peter and Mary have been assigned as DB admins of the zipcodes database they can still freely access the other user databases. Similarly, our new users John and Serena have the same rights. You can pick any database for the upcoming demos, I’ll use the one called “bands” we created before, it really doesn’t make any difference. If you log on as Serena, John or Ellen you’ll see that all of them have read/write access to the bands database. They can all create new and modify existing documents. 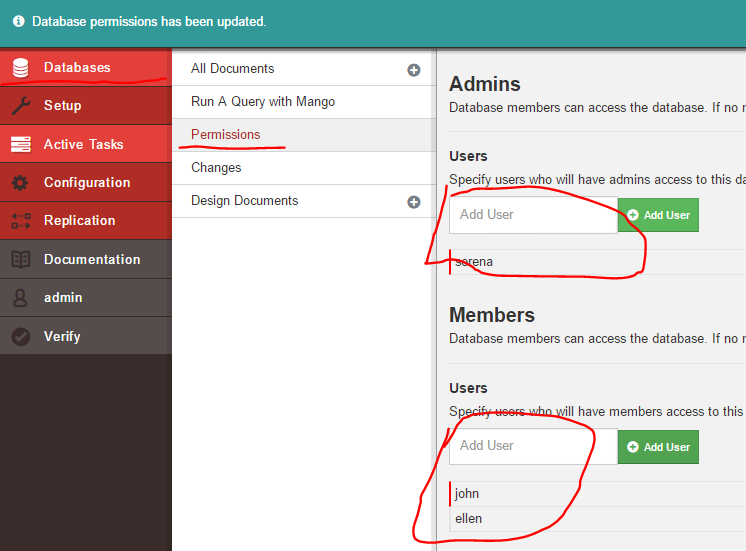 However, John and Ellen have no database admin access to the bands database. You can probably see a pattern here. CouchDB databases start off being as open as possible. Everyone is a server admin after installation. 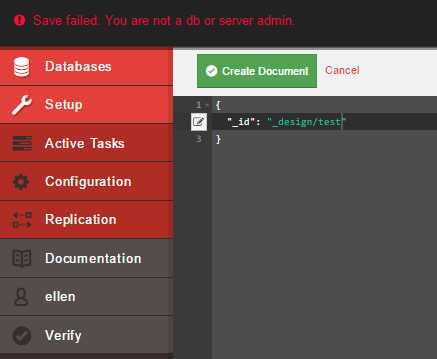 We then create a server admin which at least protects the CouchDB server from anonymous users. The server admin can create other users. These other users have by default a very wide access to the user databases and documents, although server admin rights are denied to them. Then we can allocate the users as database admins or database members to gradually restrict their access to specific databases. This is in contrast to popular relational databases where new users have very limited access rights which are then extended to specific databases and actions. In CouchDB it’s the way around: a new user has relatively wide access rights which have to be narrowed down to specific databases and actions. They are, however, allowed to create normal, i.e. non-design documents. Only server admins and database admins who were assigned to a database are allowed to create design documents. We can remove the write access of a specific user using a validation function in a design document. For a reminder you can read this post. The validation function will be called automatically when a database document is inserted or updated. Our goal is to turn John into a read-only user. We simply check the name of the user context. If it is neither serena nor ellen then we throw an exception. John can still read all the documents as expected. It can be cumbersome though having to come back to this design document and add new users that have write access. This type of control is easier to implement using database roles. We’ll look into database roles in the next post.